I’ve been getting more stories about wildlife ‘incidents’ at airports since my “At the Airport” column – “From worms to whales, the wildlife that worries airports,” appeared online and in print at USA TODAY and will share some of them in future posts. In the meantime – in case you missed it, here’s a slightly edited version of that column that was inspired by the report of a large alligator caught on tape sauntering across a taxiway between two ponds at Orlando International Airport. Whle the gator’s journey alarmed passengers and slightly delayed a Spirit Airlines flight on its way to the gate, at MCO airport wildlife visitors are not rare. All airports must manage resident and visiting wildlife because birds (mostly), as well as deer, alligators, coyote, moose and even an excess of worms on the runway after a rain (a feast for birds) can create safety hazards that lead to costly and, in some same cases, deadly collisions between aircraft and animals. In 2007, Seattle-Tacoma International was the world’s first airport to install an avian radar system to monitor potentially hazardous bird activity near the airport. Elsewhere, airports team up with airlines, environmental groups, community volunteers and others to humanely trap, relocate and resettle raptors such as hawks, ospreys and owls. On the east coast United Airlines, Audubon International and the Port Authority of New York & New Jersey work together to trap American kestrels (a climate-threatened small falcon) at Newark Liberty International Airport and send them to new homes on area golf courses with more welcoming habitats. Each year Seattle-Tacoma International Airport carefully collects and relocates fuzzy baby chicks from the nests of resident red-tailed hawks. “We actually climb the trees and take the chicks out of the nest and take them up north where we raise them to imprint on a different location,” said Mikki Viehoever, the wildlife biologist for the Port of Seattle. Portland International Airport, located on the confluence of the Columbia and Willamette Rivers and along a Pacific migratory flight path for birds, has a very active raptor translocation program. Some airports keep special vacuums in their tool sheds or a beekeeper on speed-dial to remove bees that sometimes swarm on airplane wings. Each year during nesting season for Diamondback terrapins, Fancoeur and her team also monitor the turtles migrating between a nearby wildlife refuge and the shores of Jamaica Bay. In past years, hundreds of turtles marched – slowly – across a runway, causing planes to be delayed. Now plastic barriers keep most of the turtles out of harm’s way, while staff swoop in to gather up and relocate any terrapins that insist on taking the shortcut. In addition to capturing and relocating alligators – some more than 9 feet long – at some southern airports, wildlife biologists and wildlife technicians from the USDA’s Wildlife Services unit help keep a zoo’s worth of wildlife away from taxiways and runways. Their ‘highlight’ list includes Nile Monitor Lizards, pythons, porcupines (whose quills can damage airplane tires) and loons. “What most people may not know about loons is that they are unable to walk on land,” said USDA spokeswoman Tanya Espinosa. Loons may land on a wet runway believing they’re landing on water and are then unable to get back up. “Our employees have had to physically pick loons up in order to release them,” said Espinosa. At some coastal airports oysters, clams and other shellfish have become an issue, requiring teams to go out with sweepers. In Alaska, USDA Wildlife Biologists and Wildlife Technicians also help wrangle musk ox and caribou. Musk Ox sometimes form defensive circles on the runways, said Espinosa and “And it can be very time consuming to get them out of the way.” Several hundred to several thousand caribou sometimes cross runways during migration. “It can be a beautiful sight, but also dangerous for human safety and air travel,” said Espinosa. Last year salmon were spotted swimming across a flood-prone runway at Alaska’s Seward Airport and, after several days of storms, crew clearing snow at the Wiley Post-Will Rogers Memorial Airport in Utqiaġvik (the city formerly known as Barrow) came upon a 450-pound Bearded Seal lounging on the runway. The runway is about a quarter mile from the ocean, but airport staff believe the seal made a mile-long trek around the runway to get to its chosen spot. Have you spotted wildlife at your airport? Please share the story in the comments section below. TSA’s blog has some helpful information for anyone heading home through San Diego International Airport after attending Comic-Con International this week – and for those traveling with collectibles and souvenirs from this or any other special event. TSA suggests that if you’re traveling with a collectible item that has an original seal on it that you don’t want broken, that you ship it home instead of taking the chance that the seal will broken during a TSA search. Getting dressed up in a costume to attend an event? TSA reminds travelers that neither replica weapons nor real weapons should be placed in carry-on bags and that while both replica weapons and real weapons can be packed in checked bags, actual firearms must meet packing guidelines and be declared. And, TSA s suggests that if you’re traveling with a lot of brochures, comic books or other books that you put them in your carry-on bag and then place them in a bin prior before sending them through the x-ray machines. Those items can show up as dense blocks and “Packing these items in checked bags may cause alarms leading to bag searches that can cause a significant slowdown in the screening process leading to delays and bags possibly missing their flights,” says TSA. TSA: OK to fly with small knives, golf clubs, other items. According to the TSA, passengers will be able to carry-on knives that are less than 2.36 inches long and less than one-half inch wide. 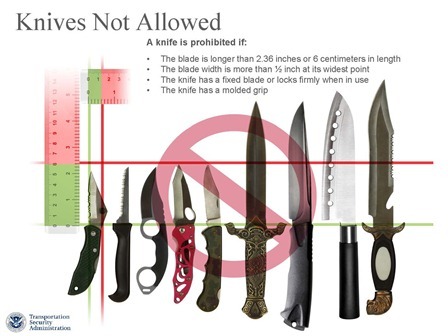 Larger knives, and those with locking blades, will continue to be prohibited, as will razor blades and box cutters, guns, firearms, and the dozens of other things listed on the published list of prohibited items. 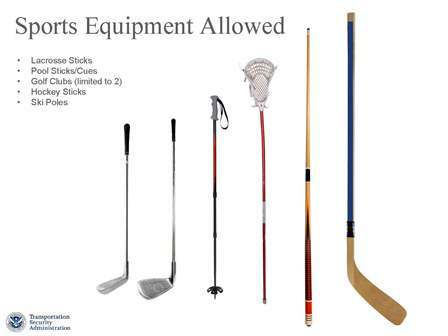 TSA will also soon permit sports equipment such as billiard cues, ski poles, hockey sticks, lacrosse sticks up to two golf clubs to be carried onto airplanes. Souvenir, novelty and toy baseball bats — such as wiffle-ball bats — will also be allowed. TSA said the new regulations will allow its officers to better focus efforts on finding “higher threat items such as explosives,” and was made as part of the agency’s overall risk-based security approach. But the Flight Attendants Union Coalition issued a statement saying they are unhappy with this move, calling it a “poor and shortsighted decision” by the TSA. “As the last line of defense in the cabin and key aviation partners, we believe that these proposed changes will further endanger the lives of all Flight Attendants and the passengers we work so hard to keep safe and secure,” the statement said. TSA believes the items it will now allow in airline cabins are “unlikely to result in catastrophic destruction of an aircraft,” and that policies already put in place — hardened cockpit doors, federal air marshals, crewmembers with self-defense training — reduce the likelihood of passengers breaching the cockpit. An original handheld metal detector used by TSA at Washington Reagan National Airport in 2002. This flag was flying over Terminal B at Boston Logan Airport when the airport was federalized in 2002. American Airlines Flight 11 left from Gate 32 in this terminal on September 11th. The first uniform issued to TSA federal screeners beginning in 2002.